The project team, which includes researchers from Case Western Reserve University via the CWRU/CSU Internet of Things Collaborative (IOTC), will develop and evaluate on-vehicle sensor systems focused primarily on rail maintenance and bus emissions. These systems will be capable of transmitting, archiving and interpreting data from the sensors, and will also provide information for monitoring on-time performance and passenger wait time for GCRTA’s vehicles. 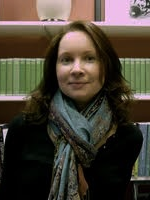 Dr. Katie Clonan-Roy is an assistant professor in the Department of Curriculum and Foundations (C&F). She started her career in education as a high school science teacher in the District of Columbia’s public schools, and completed her doctorate in Education at the University of Pennsylvania. At CSU, she collaborates with faculty to understand how teacher education programs can influence teacher candidates’ orientation to equity and social justice in education. Dr. Clonan-Roy’s research interests intersect with education, adolescent development, and gender and sexuality studies. She is currently working with an interdisciplinary team of faculty members to understand how gender and sexual minority youth access sexual health information and education in school, community, and virtual spaces. 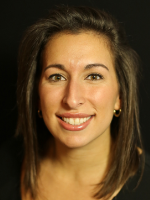 She also is conducting a qualitative research project in an after-school program for girls in Cleveland to explore how programs and schools can support girls’ critical literacy development. 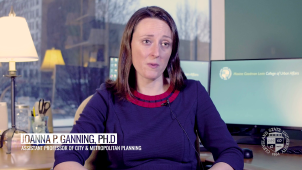 Dr. Joanna Ganning, an assistant professor in the Maxine Goodman Levin College of Urban Affairs, is the subject of this month’s featured video. Dr. Ganning’s research focuses on industry- and place-based mechanisms for economic development, especially in urban places and downtowns. Her work often intersects with community development, transportation, and other areas. Create or update your faculty profile by following this link. Add relevant terms to the “Research Keywords” section of your profile to help partners and funders find you through the Faculty Expertise Database. 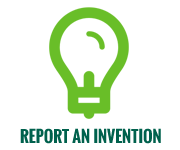 Add your picture to your profile page (replacing the stock image) by sending a photo to facultyprofile@csuohio.edu. Dr. Kelly Wrenhaven is an associate professor of classics and the Director of Undergraduate Studies in the Department of History. Dr. Wrenhaven’s primary research focus is ancient Greek slavery. In particular, she examines the ways in which the ancient Greeks constructed an ideology aimed at perpetuating and justifying the institution of slavery. Her first book, Reconstructing the Slave (Bloomsbury), examined the ideology of Greek slavery through artistic and literary representations. She is currently working on her second book, Animate Tools and Invisible Men, which is a comparative study of Greek and American slavery (Penn Press). Dr. Wrenhaven has also published works examining Greek and Roman sexuality, gender, and prostitution, and is currently writing a chapter for a forthcoming collection on Slavery and Sexuality in Classical Antiquity (Wisconsin Studies in Classics). 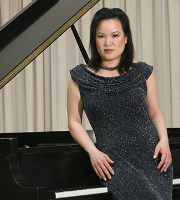 Dr. Angelin Chang, a professor and Coordinator of Keyboard Studies in the Department of Music and a professor in the Cleveland-Marshall College of Law, will conduct the Keyboard Area Concert Extravaganza on Friday, February 15, 2019 at 7:00 pm. The evening will include a tribute to CSU staff member Beverly Payton, a friend of the Department of Music, on her retirement. The concert will be held in the Waetjen Auditorium in the CSU Music and Communication Building. Admission is free and open to the public. The United States Patent and Trademark Office (USPTO) has allowed the patent application of Dr. Wenbing Zhao, a professor in the department of Electrical Engineering and Computer Science (EECS). The invention, titled “Systems and Methods for Privacy-Aware Motion Tracking with Notification Feedback,” relates to a method and apparatus for monitoring the body motions of patient handlers in nursing homes and providing instant feedback if best practices are not followed. The technology will improve patient handlers’ wellness by reducing musculoskeletal disorders. Virtual reality, augmented reality, and extended reality (AR/VR/XR) are fundamentally changing healthcare. The Medical Capital Innovation Competition (MCIC) invites the best and brightest AR/VR/XR healthcare innovators to show Cleveland and the world how you will change the future of healthcare. 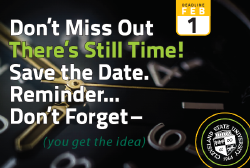 Cash prizes totaling $100,000, mentoring, and access to business advisors, including world-class healthcare systems and collaborators, will be awarded. Applications will be accepted between January 14 and March 15, 2019. On February 8 at 12:00 p.m, Anne Berry, an assistant professor in the Department of Art and Design, will moderate a panel titled, “Building Multidisciplinary Relationships Through Social Impact Design.” All panels are held in PH-104, and the full schedule can be found here. As of January 15, 2019, the federal government remains partially shut down due to unresolved budget negotiations. 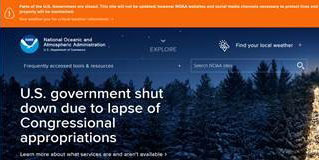 The shutdown affects a number of federal agencies with research activities, including the National Science Foundation (NSF), the Environmental Protection Agency (EPA), and the U.S. Department of Agriculture (USDA). The National Institutes of Health (NIH) and the Department of Energy (DOE) are not affected by the shutdown. Information regarding potential impacts on your research project can be found in a Frequently Asked Questions document issued by the Office of Management and Budget (OMB), and an online article in Nature describes some of the effects that the shutdown may have on federally-funded scientific activities. Please contact Sponsored Programs and Research Services (SPRS) if you have specific questions about a proposal or award. 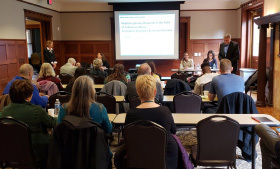 The Office of Research is pleased to remind faculty that the call for proposals for the 2019-2020 internal funding programs has been released, and the deadline for applications is February 1. To assist in the preparation of successful applications, the forms that will be used to evaluate the proposals are included at the above web sites. For more information please contact Joy Yard, 687-9364, j.yard@csuohio.edu or Dan Simon, 687-5171, d.j.simon@csuohio.edu.